In the summer of 2015 a colleague of mine from Navos was moving and I volunteered to tune up her bike as she was putting stuff into storage. When she dropped it off for me the wheels were off but it was otherwise intact. She explained that she got the bike new in 1976 in Ft. Collins and said that all she knew about it was that it was a Windsor Carrera Sport made in Mexico and that she liked riding it more than any other bike she’d ever had. I immediately noticed that the bike had a lugged steel frame with a lot of chrome. I spent some time with Google and learned that the Mexican steel company Acer-Mex made several brands of bicycle in the ’70s and ’80s. The Windsor mark was applied to some Italian-style 10-speeds that were made for export. 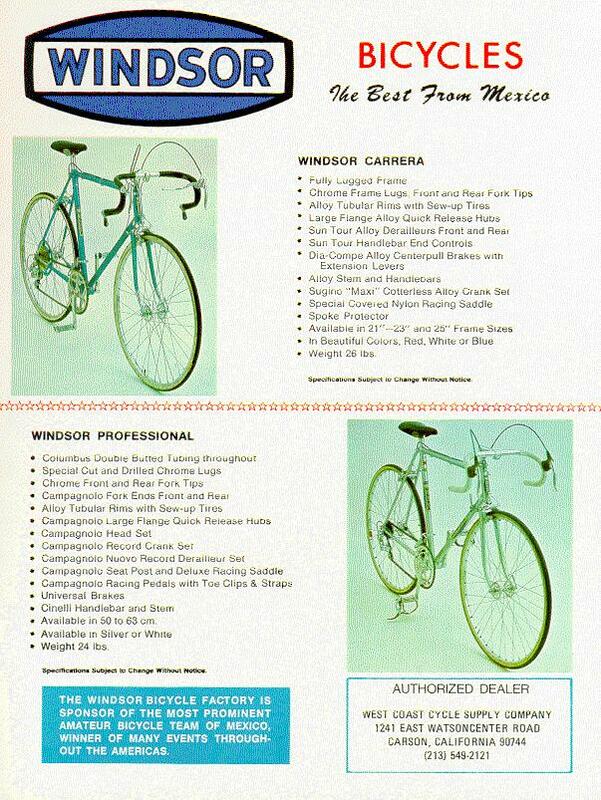 The top of the line (“professional”) model had Campagnolo components and lightweight double-butted tubes and were evidently pretty good bikes. (There was a scandal in which Acer-Mex sponsored Eddie Merckx in a one-hour record attempt in 1972, but he reportedly rode a Colnago with Windsor decals…) The Carerra (aka “international 10-speed”) was the bottom of the line but the “sport” variant seems to have had Japanese Tange straight gauge tubing and better components. Both versions of the Carrera used quality midrange Japanese components – Dia Compe brakes, SunTour deraileurs, shifters and freewheels, Sunshine hubs and Sugino cranks and bottom brackets. Gena’s 19 1/2-inch frame was originally red with chrome chain stays and fork tips. It has serial number 029852 on the upper left side of the seat tube and a Ft. Collins bicycle registration sticker. It appeared to me that the bike had new but flat tires because the tread was fresh and there wasn’t any dirt on them. 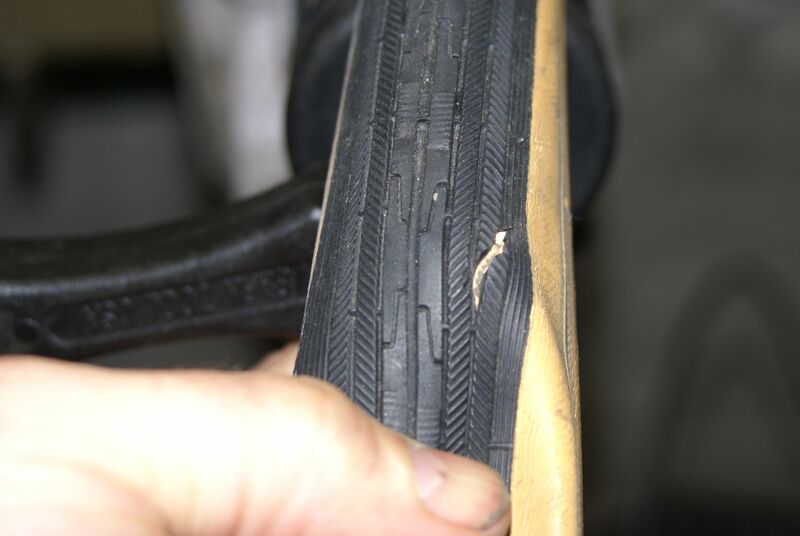 When I went to remove the rear tire I noticed a split about an inch long that followed the tread pattern and as I pulled them off the rim the sidewalls around the bead crumbled off, making me think that it must not have been ridden for several years after those tires were mounted. (When I was finally able to inflate them it turned out that the inner tubes were rotten, too.) Since the headset and bottom bracket were well greased (albeit with a slimy, jelly-like, substance) I suspect that the bike was tuned before being allowed to sit for quite a long time. The first step was de-greasing and cleaning the bike. I knew how to do that. The second step was removing the rust and polishing up the chrome. I bought some Mother’s metal polish and some Barkeepers Friend rust remover and got to work. There was a lot of chrome on this bike – it looks like the whole frame was chromed and that the paint was applied on top of the plating. There was a fair amount of rust on the the seat post and on the chain stays, but most of the chrome was not pitted very much at all and what rust was there was light. I could have invested in wet sand paper and worked through progressively finer grits but I didn’t. This bike is not exotic enough to warrant a mirror-perfect polish, it’s “best and highest” use is to be ridden. I did use abrasive balls up to about 320 grit and then some elbow grease with scotchbrite pads. I was pleased with how well it cleaned up. here’s a gallery of polished parts. I took the wheels apart and cleaned the grease out of the cups and off the the cones. Even though they looked reasonably well packed, I decided to replace the bearings. I didn’t put a lot of effort into polishing the hubs, but they cleaned up well with some degreaser and a rag. To finish the process the spokes needed a once-over with crumpled aluminum foil. (The spokes were all reasonably tight and as far as I could tell the wheels spun true. I tightened the non-drive side in the rear and then decided to leave well enough alone.) 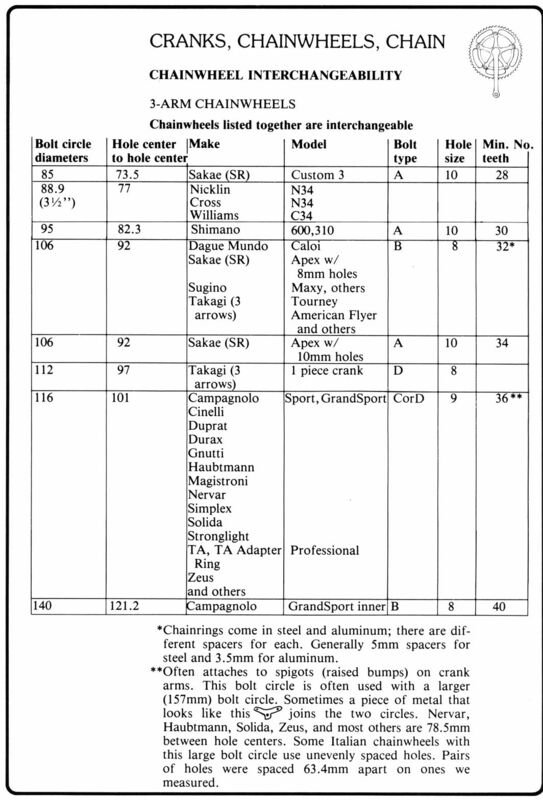 The rims don’t have hooks like more modern rims do – they may have been intended for sew-up tires instead of clinchers. They do seem very sturdy, though, with what appears to be solid aluminum where a modern rim would have a double wall. Here are some photos of the wheels. I started the reassembly process by rebuilding the bottom bracket and headset and mounting the cranks and fork. (I had to re-do the drive-side crank because I had mounted the smaller chainring with the bolt heads on the wrong side.) I bolted the cable stops to the down tube and chain stay, gauging their position by the lines where the paint hadn’t faded. I put on both derailleurs and both brakes. I put the stem in the steerer tube and mounted the handlebars. I got the brake levers on in the same place they’d been before and I mounted the saddle on the seat post and stuck the assembly in the seat tube. I started to mount the shifters but the expander bolts were stuck on both sides. I fiddled with one until it opened up and then I greased it well and mounted it on the left. As I reefed on the other one it loosened suddenly and I discovered that I’d torqued the end off of the expander bolt. A trip to Recycled Cycles uncovered bad threads in the housing and got me a $5 replacement for the whole shifter. Here are some photos of work-in-process. While at Recycled Cycles I bought 27″ tires and tubes (both by Kenda.) I reassembled the hubs with a generous packing of grease and new bearings. I did the adjustment of the cones with my fingers and fought a little with one of the locknuts (the drive side in the rear.) None of my pumps work with Schrader valves so I ordered a schrader => presta adapter – and then realized that I had a CO2 inflator that worked with either type of valve. The tires went on with just a little help from the levers and I had two 12 gm cartridges that I figured wouldn’t give a pressure much over 60 lbs on a 1-1/4 inch tire. The wheels looked good inflated and they spun fairly true and free once I put them on the frame – but boy are they heavy! I measured the chain for wear and it was still good, but it was tacky with old grease. I stuck it in a basin of simple green overnight and stripped the grease off, and then I used an 8-speed Wipperman link to put it back on the bike. I figured that I could use it to get the cables set and the derailleurs adjusted, but I splurged on a new KMC chain that I put on before I got done. I installed brake cables with new housing and then mounted new brake pads. The Dia Compe levers use the round end of the universal brake cable, as opposed to the barrel end that I think I’ve always used before (I only cut off the wrong end once.) One of the levers took a ferrule on the end of the housing but the other didn’t. The straddle cable carriers had different sized nuts & bolts in the front vs. the back. At the end of the day I decided that I liked the center pulls – they’re super easy to set up and they seem to adjust easily. I installed shifter cables with the original flexible metal housing. I had the cable stop on the chain stay reversed so I had to take that off and fix it. 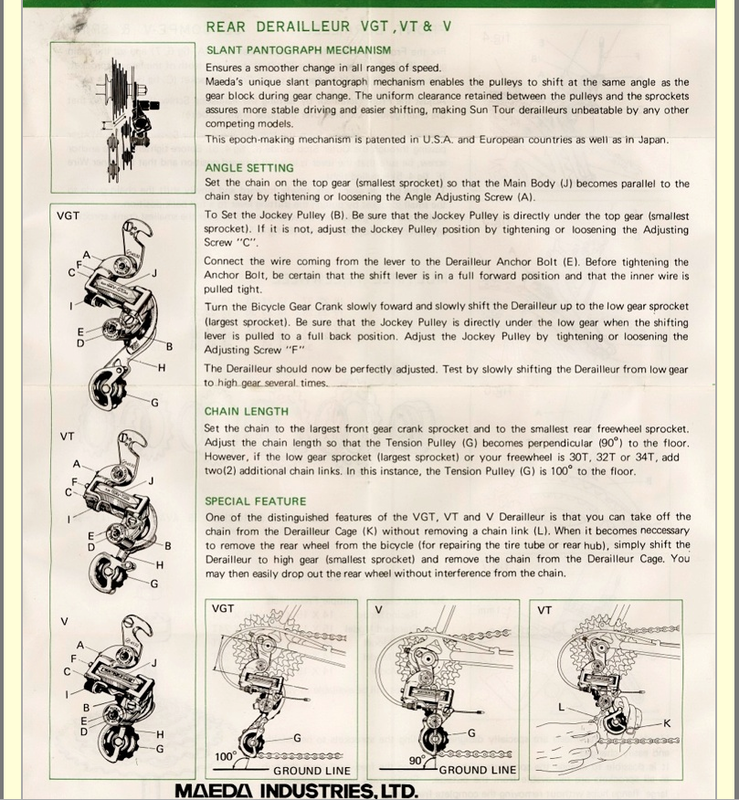 Friction shifting makes it a lot easier to set up the derailleurs – I was surprised at how simple it was to get these hooked up. I spent some time fiddling with limit screws and and clamps but at this point I was really close to having a rideable bike. Here are some pictures at the “almost rideable” stage. Here are photos of the pedals. I fiddled with the shifters and figured out that I had the barcons rotated 180-degrees from where they should have been. I had to release the cables to fix that, but with these derailleurs that wasn’t a big deal. After I was satisfied with the shifters I taped the handlebars. For some reason the left side came up about an inch shorter, but I couldn’t see any place where I’d made the wraps too close. I put the kickstand on and had to adjust it a little so that the cranks cleared it. I put the new chain on and then reworked it because the link I punched was sticky. At the end of the day I rode the bike up and down the block to check the brakes and shifting. It worked okay, but that frame is sure small. And then I decided that I was done. think about having it repainted. I suspect that you can’t powder coat over chrome, so it would likely mean me stripping the old paint and masking the lugs, chain-stay ends and fork ends before wet painting at R&E. I’d also have to buy a set of decals. I might replace or rebuild the freewheel – although the new ones don’t get good reviews online and I’m not sure what would be involved in rebuilding the original Maeda/SunTour. I would add a clamp-on water bottle cage and trade out the plastic cable guides for metallic ones. I would probably find some lighter pedals, and personally I’d lose the kickstand. None of this would make any economic sense – those first three three items alone would cost roughly $1,000 for a bike that would sell on CL for maybe $500 or $600 – but it’s a reasonable bike for Seattle’s hilly terrain and the old-school appearance and the simplicity of the components make it really attractive. What a labor of love! I found an old Windsor 10 speed in my dad’s garage – cleaning out the house in Brooklyn. It is very similar to the one you restored – it is a rust bucket and weighs a ton but the geometry is perfect for me, the frame, though heavy, is responsive, and I can ride faster on it than on my Bianchi commuter back home. Of course New York is flat compared to Seattle.